Biomass currently accounts for about fifteen per cent of global primary energy consumption and is playing an increasingly important role in the face of climate change, energy and food security concerns. 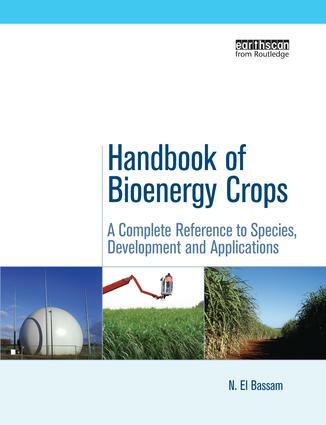 Handbook of Bioenergy Crops is a unique reference and guide, with extensive coverage of more than eighty of the main bioenergy crop species. For each it gives a brief description, outlines the ecological requirements, methods of propagation, crop management, rotation and production, harvesting, handling and storage, processing and utilization, then finishes with selected references. This is accompanied by detailed guides to biomass accumulation, harvesting, transportation and storage, as well as conversion technologies for biofuels and an examination of the environmental impact and economic and social dimensions, including prospects for renewable energy. This is an indispensable resource for all those involved in biomass production, utilization and research. Dr. N. El Bassam is the Director of International Research Centre for Renewable Energy (IFEED) in Germany.